Namma Metro Travel Card is the Contactless Smart Card used in Namma Metro for travel.People planning to take multiple journeys can buy Contactless Smart Cards (CSCs), which also have discounted fares. All cards will have a unique 11-digit number on the back. The Travel Card can be loaded with the following different types of Tickets. Varshik, Sanchar, Saral and Saraag. Varshik (Stored Value Ticket): Varshik is Priced at Rs.100 and the smart card can then be recharged from Rs. 50 to up to Rs. 1,500. It has a one-year validity, with a 15% discount on travel fares. Sanchar (Trip Ticket) :- It is based on number of trips. It is available in denominations of 10, 40, 50 and 100. Saral: Saral is Priced at 70. It allows a day's travel in non-A/C buses of BMTC and the metro. Saraag: Saraag is Priced at Rs.110. 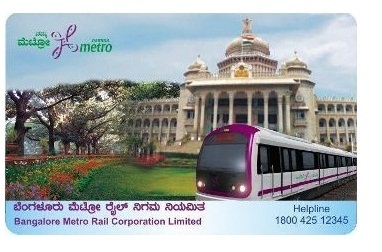 It allows a day's travel in BMTC A/C buses and the metro.